Lev Mamuya appeared most recently on Show 278, recorded in October 2013, at age 17. Previously, he appeared on Show 174, recorded in February 2008, at age 11. 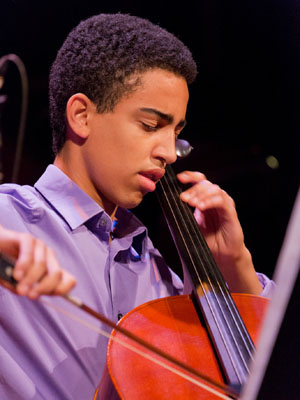 Lev Mamuya (cello), 17, is from Newton Highlands, Massachusetts, and he attends The Roxbury Latin School in West Roxbury, Massachusetts. He is a cello student of Michael Reynolds at the New England Conservatory, studies at the Perlman Music Program in the summer, and has attended Greenwood Music Camp. He appeared as a soloist on the From the Top radio and TV programs in 2008. Lev was the first place laureate in the Sphinx competition in 2013 and recently performed with the Boston Pops Orchestra. In his free time, Lev enjoys reading, running cross-country, hiking, playing video games, and basketball. Most importantly, Lev is a fervent Boston sports fan.